There are not many things of which I am absolutely certain: I am not sure of my future; my weak memory has ensured I am unsure of my past; a niggling thought in the back of my mind tugs on the possibility that someone has withheld it from my knowledge that I’m actually a witch – maybe my letter to Hogwarts was shredded because my mum would miss me too much. I am, however, absolutely certain of 2 things: Rainbow Rowell is a fabulous author, a mage – in her own right – of manipulating mundane words to portray beauty, and overlooked characters to occupy depth; and Carry On is my favourite novel of the year so far, maybe even ever. As aforementioned, my weak memory makes it so that I struggle to remember things like how good previous books were. I do commonly get a familiar feeling when I think of my favourite books, though. A brief rush through my diaphragm, a tingling in my fingertips to pick up a book. This novel is already giving me these feelings. I loved it that much. Firstly, what I should acknowledge is that if you haven’t read Fangirl, you can still read this book. Frankly, I’m looking forward to reading Fangirl after reading this book. Rainbow Rowell first created the character of Simon Snow within Fangirl, a character that Cather Avery had manipulated to suit her fictitious theories surrounding her favourite book series. Rowell concluded that she was able to let go of Cather and her story with love interest Levi – she was content with their ending. She could not, however, let go of Simon and Baz. She felt as though she owed them a full story. And that is Carry On. And that, I would say, is beautiful. Carry On is haunting me, and this is both because of the meaning, and the depth. Rowell is never afraid to challenge normal concepts, and I love that. 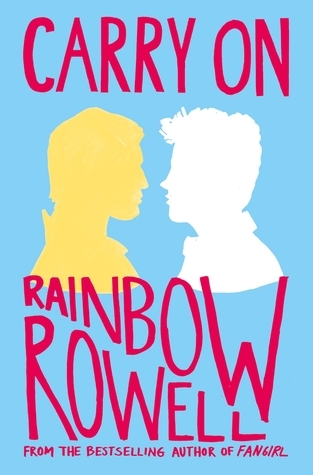 Whilst Carry On reflects both Harry Potter, and the fanfiction written about it, I would not hesitate to say that it exists in its own right – J.K. Rowling has never made me feel like Rainbow Rowell has. Of course, Rowling is a talent, a soul that has generated the most well-known series in history, enjoyed by the old and young alike. But Rowell…Rainbow Rowell gives me butterflies. Frankly, Rainbow Rowell makes the whole zoo erupt in my stomach. She destroyed me with Fangirl, and Eleanor & Park, and Kindred Spirits, but I have never felt so much towards one book – Carry On has consumed my heart. Carry On is a book in its own right, despite its nature as a compilation of all the stereotypical Chosen-Ones. I find it difficult to compare it to any other book. This book switches a lot between POV, which I think really helped the pace, and ensured the book was constantly engaging. It was also really nice to have an insight into all fo the character’s inner thoughts. Likewise, this novel is impossibly hilarious. On many occasions, it was laugh-out-loud funny. Rainbow Rowell possesses a great sense of wit, and mentioned many a thing that resonated with me as comedic. Because the book has a current setting, and the characters were very much aware of life outside of magic, it was very easy to relate to. I went into this novel expecting big things. I went into this novel expecting a journey, and – as usual – Rowell did not let me down. This book is a roller-coaster for your emotions, a medley of meaning and emotion that will resonate with every part of your personality. The pace of this novel is consistently ideal for the happenings. It never feels too slow, and each internal monologue from each character is endlessly interesting, endlessly thought consuming and provoking. The characters are laden with depth – each has their own woes, and each has multiple dimension, just like everyone in the world. These characters are hyper-realistic, despite their unnatural setting – the people you would meet in the street, or sit next to on the bus, unknowing the trouble their going through, unknowing of the life pumping through their veins. I feel like I’m rambling, so I’m going to wrap it up! If you enjoy fantasy, teen angst, and soul-consuming romance, Carry On is the book for you. Trust me. I’m not even a fantasy lover, and I adored this book, explaining as to why I awarded it 5/5 stars. Carry On, or Carry On, Simon, was mentioned in another book – Fangirl – and so I am entering this novel for the number 9 spot on the Around the Year in 52 Books challenge: A book that was mentioned in another book. Yay! I’m so glad I just saw this post! I’ve been hearing about this book a little bit lately, and I was debating whether or not I should find it at the library to read this month or if I should wait. you just convinced me! I am definitely picking this up first change I get. How similar is this to the excerpts of Carry On that are in Fangirl? If I skimmed over most of the excerpts (I just wanted to hurry up and read about Cath and Levi, okay? xD), would I probably not appreciate this book? Thanks! & I already want to re-read it haha! You’re welcome! And I know the feeling- the second I finished I started flipping back to the start! I wish I’d highlighted as I went through so I could flick to my favourite moments – I guess that means I’ll have to reread it at some point haha! Ah I know what you mean!! !